The enrichment activities we offer, both during regular school hours (at no additional cost) and in the early morning and afternoon (for an additional fee), are part of what makes Suburban such a wonderful place. 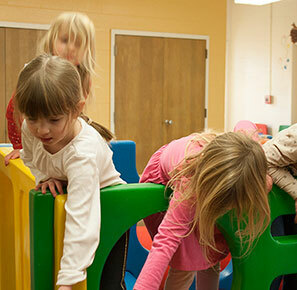 During school, creative movement is taught by children’s gym owner Celia Kibler. This program provides opportunities for children to develop the large motor skills and coordination involved in basic locomotion movements: walking, hopping, skipping, running, galloping, etc. They learn to isolate and manipulate individual body parts. They follow two-, three- and even four-step directions: hop, hop, turn and jump… The children learn to listen and cooperate in a large group setting. Activities are presented which offer dance improvisation, problem-solving, critical listening games, etc. Children have opportunities to work individually, with a partner, and with the entire group. Field trips (pumpkin patch, strawberry picking, nature walks, etc.) are also a part of the Suburban Nursery School. Each Fall and Spring, our classes visit local farms to explore farm life, agriculture, and nature. Our school grounds are also bordered by nature trails, giving our classes regular opportunities for walks to learn about the seasons, animals, plants, and other natural elements. Suburban Nursery School’s outdoor space includes a school garden. Populated with many animal, insect and plant species, this space provides opportunities for our students to learn about natural life cycles and ecosystems. Children are free to play and dig in this area during outdoor play, and classes regularly participate in planting and cultivating activities. Each year, we welcome Spring with the release of butterflies who metamorphose in our classrooms. An option for all our birds who need to spread their wings a little earlier. Drop off your child for an all-school playtime at 8:45am for a nominal cost ($7/morning) or stay with them and play for free. Earlybirds playtime is held outdoors (weather permitting) or in the Rainy Day Room (Purplebirds Room, #10). Children may be registered for 1,2,3,4, or 5 mornings/week. Drop-ins students are welcome if space is available. Students eat lunch, have a short rest, enjoy teacher guided projects, and as always have lots of time for PLAY! There are no parent co-oping responsibilities for the afternoon program. Children are guided by our Purplebird teacher and our classroom aides. Enrollment is open to potty-trained, non-napping Bluebirds (3-year olds) and Redbirds (4-year olds). Yellowbirds (2-year olds) who meet these requirements will be evaluated before acceptance into the program. Children may be registered for 1,2,3,4, or 5 afternoons/week. Space is is limited and filled in order of applications received. Drop-ins are allowed if space is available.